Left Behind – This corn crib stands as a reminder of a time that was in the face of the time that is. This corn crib is along MN Hwy 5 which now is a major highway. The powerlines have ignored it. People drive by with nary a glance or in many cases even a recognition of what this was, what it’s importance was in the history of agriculture. The time when we stored ear corn on the edge of the field is long gone. Corn is shelled the day it’s picked and put in storage or sold. We no longer need this “technology” shown us by the Native Americans to store and dry our corn. 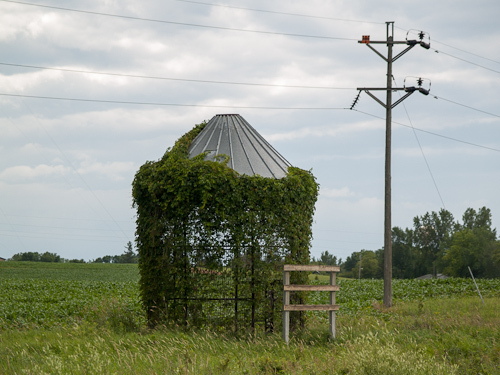 This entry was posted in Uncategorized and tagged agriculture, copyright ryan ware, corn crib, farming methods, grain storage. Bookmark the permalink.